The new homes for sale in Greenville, SC have risen sharply in recent years with Greenville's becoming a destination for retirees moving up from the heat of Florida or down from the snows in the North. Greenville's designation as a top 10 city by Outside Magazine and Livability.com has not hurt new homes in Greenville either. Seniors enjoy the new homes for sale in Greenville, SC including patio homes, cottage homes, historic homes and new custom homes. What are patio homes? Patio homes or cluster homes are part of a unit of several houses attached to each other. It can share a wall or several walls. It is similar to condos or townhouses in this way, but in miniature. Patio homes tend to have only one to one and a half stories, compared to townhomes which have two stories or more. They might or might not have a concrete or wooden deck or patio outside. Patio homes in Greenville, SC are also referred to as carriage homes, garden homes, cluster homes and courtyard homes. Patio homes are a recent addition to the housing scene according to Realtor.com and Joshua Zinder of Princeton, NJ. The patio homes in Greenville came into fashion in the 1970's as gated and shared new home communities popped up all over the U.S. The exterior maintenance and landscaping are usually covered by an association fee. The existing and new patio homes in Greenville, SC are located in many different parts of Greenville from the Pelham Road area (north east of Greenville center) to Simpsonville and the Woodruff Road corridor which is still only minutes from downtown Greenville. These patio home subdivisions have full lawn maintenance, exterior maintenance and gated communities in some cases. 1200 Pelham - With a banner of peaceful living on Greenville Eastside the website for 1200 Pelham patio homes boasts of maintenance free home living. This location is great for getting to downtown Greenville, SC or for easy access to restaurants and shopping with Haywood Mall mere minutes away and the shops as Pelham and I-85 just as close. Other than downtown Greenville it would be hard to find a better location in Greenville. Cypress Run Patio Homes - Cypress run features all brick garden homes with courtyard entry near Woodruff Road. They are mostly one story for easy living. Some homes were built around 2000, but there are also some new patio homes for sale Greenville SC. Ivybrooke Patio Homes - Ivybrooke is located off Pelham Road with easy access to I-85. The gated community features brick accents on the exterior and mostly one story homes with some bonuses upstairs. You'll enjoy the pool and quiet nature of the neighborhood. Patio homes for sale were built around 2001. Kenwood Patio Homes - Kenwood is a small, gated community on Roper Mountain Road near Woodruff Road. The patio homes are all brick or stone on the exterior and mostly one story, with luxury upgrades and gourmet kitchens. Most were built around 2004. Heritage Club 4 Patio Homes - Heritage Club IV is located across from the Symmes Library on Pelham Road with access to I-85. The gated community features all one story homes with some brick accents, a pool, sidewalks, club house and exercise facility. The were built around 2001. Lexington Place Patio Homes - Lexington Place is located off Pelham Road near I-85. This popular community is quiet, well maintained, and has some stone accents. A portion of the subdivision has two story traditional homes, but the majority are patio homes that are almost all one story. The patio homes were built around 2001. Magnolias At Southridge - Magnolias is off E. Curtis and not far from the center of old town Simpsonville. They are one story homes set up for easy living with some brick accents and vinyl siding, and built in 2004. Homes are generally under 2000 sf. Pelham Springs - Pelham Springs is located on Pelham Road near Haywood Road and is at a high point of the area, so you may have views from these units. The gated community features stone or brick fronts and upscale interiors with some bonus rooms upstairs. You'll also find a pool and common areas. Homes were built around 2003. The Arbors - The Arbors are located near Woodruff Road at Highway 14 and Roper Mountain Rd near Five Forks and feature all brick exteriors. Built by quality builders, youll find mostly one story homes with some bonuses upstairs. All homes are fenced with irrigation systems. What is a cottage house or home? Typically a cottage as defined by realtor.com is a small house. It may carry the connotation that it is old or an old-fashioned style building, or simply old style building materials. In today's language a cottage is usually a modest, quaint and cozy home. Typically a cottage home in Greenville, SC is in a semi-rural setting. Cottage homes are popular among retirees and empty-nesters and include lawn maintenance. The Net Zero Farm subdivision in Greer, SC is a remarkable cottage community with a great deal included in the association fees. The mill homes of Greenville's textile past are sometimes converted into updated cottage homes. Some "cottage" homes in the luxury communities are quite large by the average Greenville resident's standards and can cost more then a large home. Luxury homes for sale in Greenville, SC can sometimes be described as "cottages" so beware when searching for homes. Historic homes often have a cottage look and feel. Historic homes for sale in Greenville could be old mansions or mill homes. Cottage Homes for sale with master on the main level, single story and lawn maintenance too! Abney Mills - a city neighborhood with cottage homes. This neighborhood has seen revitalization recently because of it's proximity to the Kroc center, A.J.Whittenburg engineering elementary school, the new Unity Park Greenville is building downtown and the Swamp Rabbit Trail. Great location and very affordable. Alta Vista - The Alta Vista neighborhood located in downtown Greenville, SC has cottages amid luxury homes. The swamp rabbit trail is also close to this cottage community. The location is ideal and zoned for excellent schools. Many of these homes have seen full renovations and have the new home feel with the character of established homes. Augusta Road - This area is close to downtown and has a great walkability score with many established homes that have seen full renovations. While these homes are quaint and have good bones they are priced higher then the Greenville average because of their location and upgrades. Ashby Park - These cottage homes in the Simpsonville, SC area are near Woodruff and Butler Roads. This is a popular area with easy access to I-385. 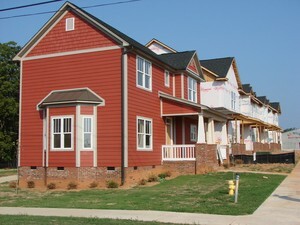 The subdivision features new single family homes. These homes are designed for easy living with yard maintenance. They are mainly one story with some bonus rooms upstairs and have upscale features with brick or stone accents. The community features a pool, playground, some sidewalks, ad were built around 2003. Cottages of Brookstone Meadows - Built in 2013 these cottage homes offer spacious kitchens, granite, open floor plans and more. 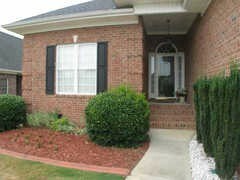 Located near I-85 in Brookstone Meadows, a golf community, you will love the lifestyle. If you are searching for homes for sale in Greenville, SC with a pool you have found your place. The Acadia Cottages - These luxury cottages offer a wonderful variety of conveniences. Part of the renowned Acadia community these cottage homes are just the right size with custom finishes, unique styles and architectural elements. They are built with attention to energy efficiency for future appreciation value. Annandale Estates - This cottage style home is in the Furman area and includes lawn maintenance and new homes. The homes are ranch style with stone exteriors, 1-2 car garages, 2-3 bedrooms and up to 1,700 SF. These homes come with a 10 year structural warranty as well. Best of all there is easy access to the Swamp Rabbit Trail which is a great feature for future real estate appreciation in Greenville. Bella Grove - These are part of Hollingsworth Park Greenville and are in the traditional developments bringing you cottage homes in Greenville. These homes are limited to 1.5 stories high with the living space all on one level and an optional bonus room or bedroom/office upstairs. In this are the lawns are maintenance free with walking trails, pocket parks and access to all the other great Hollingsworth Park amenities. Benton Park - Located in Powdersville these new cottage homes offer craftsman style, open floor plans, hardwoods, granite and stainless appliances. Yard maintenance is included in the HOA fees for easy living. Bluestone Cottages - Offer the maintenance free living we have come to associate with the cottage homes in Greenville, SC. Affordably priced, with open floor-plans and tasteful touches these homes in Taylors, SC are in a great location relative to Greer and Greenville downtown areas. Between both city centers residents have a multitude of activities, shops, restaurants and more to choose from. Cliffs Valley - Part of The Cliff golf communities these cottage homes with mountain views and beautiful home sites are part of a wonderful quality of life. Tons of amenities comes with being part of The Cliffs including walking trails, wooded common areas, golf courses, clubhouses and more. Cottages at Harrison Bridge - Have custom built craftsman style homes. Lots of attention to detail in these homes with upgrades and floor-plans to appeal to modern tastes. All lawn care, sprinklers and exterior maintenance in this community is provided by the HOA. Get sold report for PATIO HOMES. Be better informed about selling prices for properties and your future home. What's SELLING in PATIO HOMES in Greenville, SC? Shadwell Townes at Hollingsworth Park - This area of Hollingsworth park is an intimate townhome community where the residents can feel connected and enjoy the great amenities and outdoor areas that hollingsworth legacy park offers. This community is maintenance free. These homes have open layouts and attached rear entry garages. Shadow Moss - This newer home development by Windsor Aughtrey offers easy living in an area near Woodruff Road and I-85. The community features stone accent exteriors, pool, clubhouse, and walking trails. There are one and two story units with square footage ranging from 1500-2500 sf. Additional homes we help sell include brick homes for sale in Greenville SC, or homes for sale in Greenville SC with land. Old homes for sale in Greenville SC are not always a bargain simply because they are old. We also sell homes for sale in Greenville SC on Zillow, and New custom homes for sale in Greenville SC. Contact us to help you with your new, cottage, patio or townhome purchase.